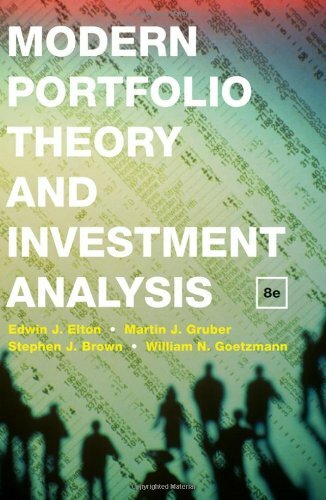 An update of a classic book in the field, Modern Portfolio Theory examines the characteristics and analysis of individual securities as well as the theory and practice of optimally combining securities into portfolios. It stresses the economic intuition behind the subject matter while presenting advanced concepts of investment analysis and portfolio management. Readers will also discover the strengths and weaknesses of modern portfolio theory as well as the latest breakthroughs. Edwin J. Elton is Nomura Professor of Finance at the Stern School of Business of New York University. He has authored or coauthored eight books and ore than 110 articles. These articles have appeared in journals such as The Journal of Finance, The Review of Financial Studies, review of Economics and Statistics, Management Science, Journal of Financial Economics, Journal of business, Oxford Economic Papers, and Journal of Financial and Quantitative Analysis. He has been coeditor of the Journal of Finance. Professor Elton has been a member of the board of directors of the American Finance Association and an Associate Editor of Management Science. Professor Elton has served as a consultant for many major financial institutions. A compendium of articles by Professor Elton and Professor Gruber has recently been published in two volumes by MIT press. Professor Elton is a past president of the American Finance Association, a fellow of that association, a recipient of distinguished research award by the Eastern Finance Association and a recipient of the James Vertin award from the Financial Analyst Association. Martin J. Gruber is Nomura Professor of Finance and past chairman of the Finance Department at the Stern School of Business of New York University. He is a fellow of the American Finance Association. He has published nine books and more than 100 journal articles in journals such as The Journal of Finance, The Review of Financial Studies, Review of Economics and Statistics, Journal of Financial Economics, Journal of Business, Management Science, Journal of Financial and Quantitative Analysis, Operations Research, Oxford Economic Papers, and The Journal of Portfolio Management. He has been coeditor of the Journal of Finance. He has been president of the American Finance Association, a director of the European Finance Association, a director of the American Finance Association, and a director of both the Computer Applications Committee and the Investment Technology Symposium of the New York Society of Security Analyst. He was formerly Finance Department editor for Management Science. Professor Gruber has consulted in the areas of investment analysis ad portfolio management with many major financial institutions. He is currently a director of the Daiwa closed- end funds. He is formerly a Director of TIAA,Director and Chairman of CREF, Director of DWS Mutual Funds, and Director of the SG Cowen Mutual Funds. Stephen J. Brown is David S. Loeb Professor of Finance and Coordinator of undergraduate finance at the Leonard N. Stern School of Business, New York University. He has served as president of the Western Finance Association and on the board of directors of the American Finance Association, was a founding editor of The Review of Financial Studies, is a managing editor of the Journal of Financial and Quantitative Analysis, and has served on the editorial boards of The Journal of Finance, Pacific-Basin Finance Journal, and other journals. He has published numerous articles and four books on finance and economics-related areas. He has served as an expert witness for the U.S. Department of Justice and has testified on his research before a Full Committee Hearing of the U.S. Congress House Financial Services Committee in March 2007. William N. Goetzmann is Edwin J. Beinecke Professor of Finance and Management Studies and director of the International center for Finance at the Yale School of Management. He is currently president of the Western Finance Association and has served on the board of directors of the American Finance Association, His published research topics include global investing, forecasting stock markets, selecting mutual fund manager, housing as investment, and the risk and return of art Professor Goetzmann has a background in arts and media management. As a documentary filmmaker, he has written and coproduced programs for Nova and the American Masters series, including a profile of the artist Thomas Eakins. A former director of Denver's Museum of Western Art, Professor Goetzmann coauthored the award-winning book The West of the Imagination. Elton, Edwin J.; Gruber, Martin J.; Brown, Stephen J.; Goetzmann, William N.
2. Modern Portfolio Theory and Investment Analysis, 8th ed.